A magnesium deficiency can kill your appetite and make you feel tired and weak. If you don’t address the problem, it could lead to serious health problems. Magnesium is at work in every cell of your body. It helps convert food into energy, regulate your nervous system and create new proteins. But what happens if you’re not getting enough? Naoki Umeda, MD, a specialist in integrative medicine, answers questions on what you need to know about this important mineral. Q: What are early signs you’re running low on magnesium? A: One of the first signs of magnesium deficiency is often fatigue. You may notice muscle spasms, weakness or stiffness as well. Loss of appetite and nausea are other common symptoms in the early stages. However, you may not notice any symptoms at all in the beginning. A magnesium deficiency can be hard to diagnose. Many of the initial symptoms could indicate a wide variety of other health issues. Q: Are there more serious effects if you don’t catch a deficiency early? A: If a magnesium deficiency goes untreated, you may develop symptoms such as numbness and tingling, personality changes, abnormal heart rhythms and seizures. It’s important to talk to your doctor if you see any signs of deficiency. He or she can run a blood test or check calcium and potassium levels to help pinpoint the problem. Q: How can you get more magnesium in your diet? A: Adults need about 400 mg of magnesium per day. Choose foods such as spinach or other greens, nuts and seeds that are rich in magnesium and other important nutrients. A simple mango, avocado and black bean salad is a delicious way to give your magnesium levels a healthy boost. Both avocados and black beans are magnesium-rich. And, if your diet alone doesn’t provide enough, you can take an oral supplement. Which type? Any type should be good. It’s controversial what type is best (magnesium citrate vs. magnesium oxide, etc.) but there’s no definitive scientific data to date proving on type is better than another. Q: Are topical magnesium sprays from health food stores a good source of magnesium? A: There’s no evidence that topical sprays deliver magnesium to the body effectively. Stick with eating foods high in magnesium or using over-the-counter supplements. Q: Any last advice on the benefits of magnesium? A: There is one way in which topical magnesium is useful, but often underused. In emphasizing a holistic, natural approach that focuses on care for the body, mind and spirit, Epsom salt (magnesium sulfate) is very beneficial in reducing stress and muscle pain when used in the bath. Helping manage daily stress and minimizing pain is an important step in feeling well mentally and physically. Magnesium also can help reduce the frequency of migraines. It’s often recommended for those who suffer from vestibular, ocular and common migraines. 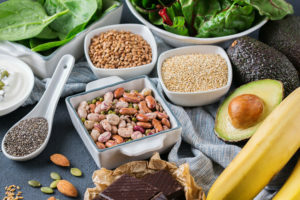 Ultimately, making sure your body is getting enough magnesium not only helps you maintain good health in general, it also may help you manage stress, migraines or muscle aches and pains. Don’t ignore feelings of tiredness or weakness. It’s a good idea to talk to your doctor if you notice any of these signs to find out what’s behind your symptoms.